This is a simple mechanical pedometer that started my want to track my steps. Because the counters are completely mechanical and it sits on the hip (best place to track walking motion) making step counter very accurate. Unfortunately, I find the pedometer to be large and uncomfortable. And since I carry my cell phone in my jeans everywhere I go, I wanted to find an accurate and battery smart android pedometer app. The upside to having an app is advanced history storage. The mechanical pedometer only stores up to 7 days worth of steps, and cannot be easily shared. This free android app is the only one (I tested) that claims to be hardware-based steps. Some of the newer android phones support a feature where instead of using accelerometer sensor. Note that this feature is not available on all androids, but the most recent android phones can utilize this feature. I did not like their overall interface, as I find it difficult to pull up step history. Additionally, during my two week test period, this app did crash once and did not track any of my data. The only way I found to "restart" the app is to reboot the phone. The app did have a widget, which for a pedometer app I think is a must for a pedometer android app. There are many settings including stride and weight (it does track weight history, though you have manually enter it). It is able to sync with MyFitnessPal, though I did not use this feature. This is another free android app, and the first one that I tried. Unlike the first app, this has a very basic interface, but the upside is improved simplicity and easy to track history. I could not determine if this app uses hardware-based step counter, but it was easy to use. During my testing, it did crash one time, but halfway through the day began tracking steps again. It does have a android widget. The step counter seems unreliable, and I often time found my step counter to be substantially higher in the morning than actually walked. This free android app is the one that was recommended by my iPhone friend. Likely a port, this one was the only android app I tested that did not have a widget. This was a deal breaker for me. The only upside to this app is it tracks (via GPS) your location for where you walk and displays it back for you when you load the app. The downside to using GPS is it does use more more battery. However, the biggest downfall to using this app is the step count takes time to "catch-up". When the Moves app first loads, it shows with zero steps, but over then next minute, the steps began to roll in, also showing the GPS locations. The history is easy to pull up, and gives a daily notification of your previous day's step count. You can sync the app up to your Google account for it to sync data to your account. The fact that it lacked a widget and displayed delayed stats was a deal breaker. 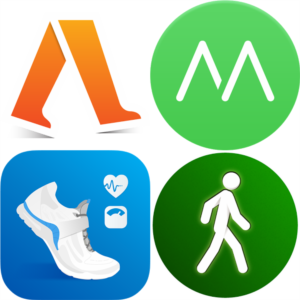 This app is my favorite one (despite the confusing name that has nothing to do with walking). Fortunately, this free android app is the most refined. The step counter widget is accurate and updates in real time. The main app's interface shows your distance walked (by day, week, month, year) in chart form. The are many setting options that can be tweaked including step distance, ability to connect to myFitnessPal, sensitivity modes, and the ability to automatically pause when charging toggle. It is also the only app that has ads prominently displayed in the main app. Of the 4 apps, Accupedo is my favorite option. My second favorite option is Noom, followed by Pacer in third, and last option by Moves. Accupedo has not only been the most stable, but also provides me with the most information. I carry it with me in all my sport outings and it tracks my activities. Even though their widget has a big ad, it also provides the best features. A recommendation I would recommend to all apps is the ability to add a widget to lockscreen. But, until smart watches and FitBit like devices become more popular, my Moto X will replace my mechanical pedometer to track my steps.